Mount Dhaulagiri expedition is considered the most interesting and enjoying among the eight-thousanders. The Dhaulagiri Himal lies south of the Tibet/Nepal border and the culminating high point at its eastern end is Dhaulagiri l. The seventh highest mountain in the world, Mt. Dhaulagiri towers in solitary splendor. Dhaulagiri; the name is derivative from Sanskrit “Dhavala” means ‘White’ and “Giri” is ‘Mountain’. Dhaulagiri (8167m), the “White Mountain”, was first climbed by Swiss in 1960. The mountain was sighted by British surveyors in India in the early 1800s and was mapped by secret Indian surveyors in 1873, but the region remained largely unknown until a Swiss aerial survey in 1949. 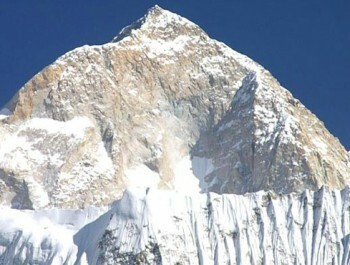 It is also the highest mountain located entirely within Nepal. 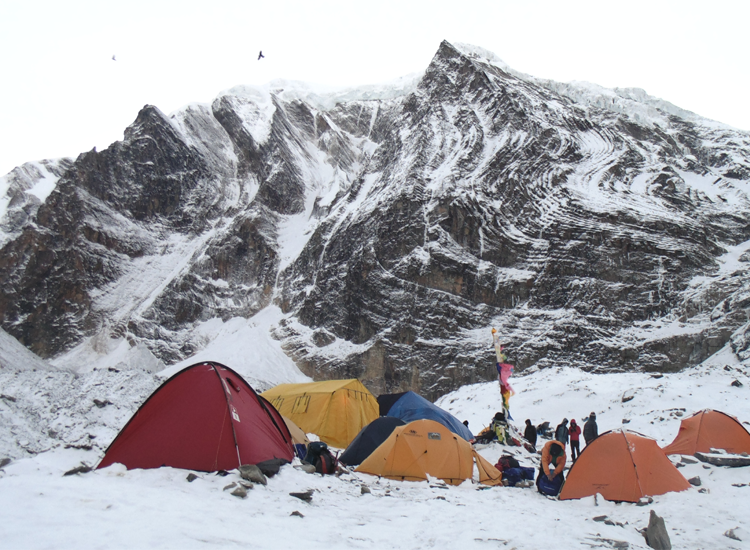 Dhaulagiri Expedition is a perfect trip for those who would like to explore the more intense experience of the mountain. After a short flight from Kathmandu to Pokhara and Beni, you will spend the first few days of our expedition walking through cultivated fields connecting mountain villages, enjoying the shops, tea houses, and normal everyday lifestyles. 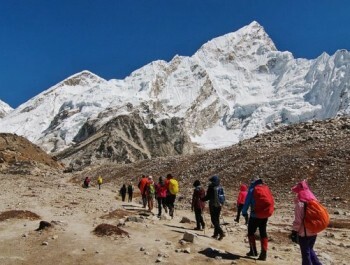 We will trek deep into the Dhaulagiri region, providing more spectacular views of Mt. Dhaulagiri, Thorong Peak, Annapurna I and Kali Gandaki, the World’s deepest gorge. You must cross two high passes; French pass, (5360m) and Dhampus pass (5,182m) before the base camp at the height of 5,300m. 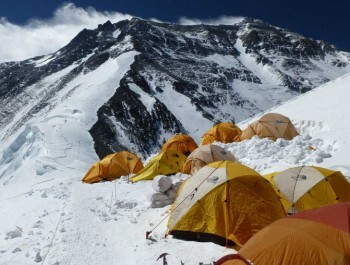 And your real expedition of Mt Dhaulagiri begins from this base camp. Moreover Dhaulagiri expedition around the Dhaulagiri massif, displaying the beauty and wilderness of Nepal’s remote area, which truly is an adventure for any trekking enthusiast. The normal climbing route is considered a reasonable climb with only short technical climbing sections and moderate avalanche danger. The South and West faces of Dhaulagiri both feature massive drops; each rises over 4000 meters from its base, and each has been the site of epic climbs. 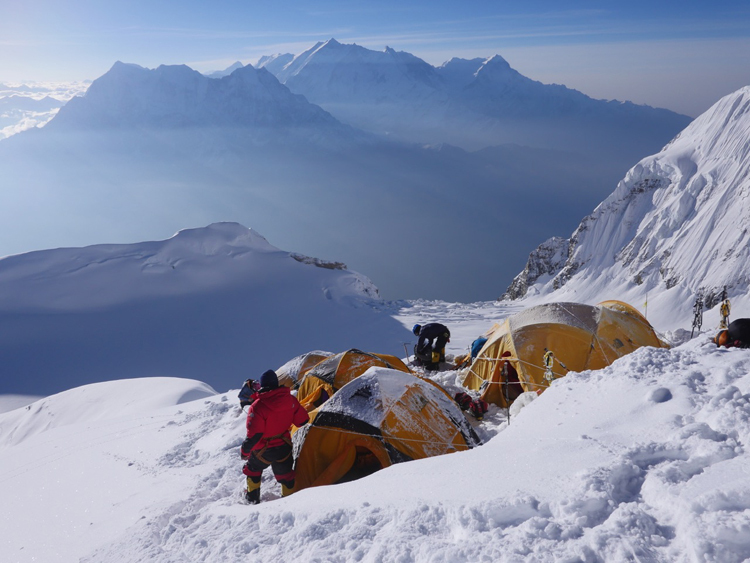 The Dhaulagiri Mountain being one of the world’s 14 above 8000m high mountains, demands the best quality of technical equipment and highly motivated technically sound climbers team. It has typical weather conditions which are very difficult to predict. 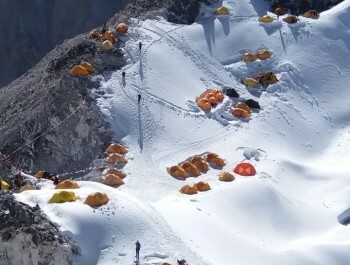 We are ready to provide a comprehensive service organizing all necessary permits, and climbing documentation, traveling logistics including airfares, ground transportation, porters, and other individual services required by mountaineers during your Nepal Mt. 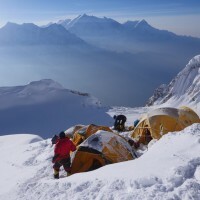 Dhaulagiri expedition. 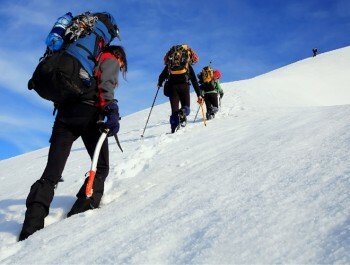 You must be proficient in climbing in all weather conditions with some experience on snow and ice. You must be able to climb with an alpine pack on your back. 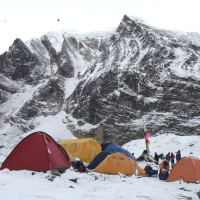 Experience with high-altitude conditions and camping is ideal. 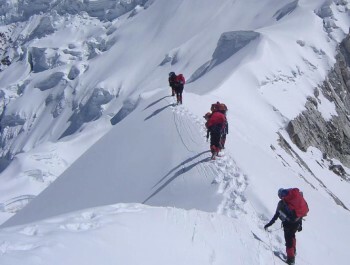 Previous climbing experience with ascents of 7000 metre peaks strongly advised. You must be in excellent physical condition, having prepared for this expedition for at least half a year prior to the expedition with a rigorous training regimen. For more information about required levels of fitness, please contact us to discuss further. This is the most important thing you can do to prepare for your expedition and key to your safe success! Day 02: Official formalities, expedition preparation in Kathmandu. Day 03: Drive from Kathmandu to Darbang (920m) about five hours, camping. Day 04: Trek from Darbang to Dharapani, camping. Day 05: Trek from Dharapani to Muri, camping. Day 06: Trek from Muri to Bagar, camping. Day 07: Trek from Bagar to Doban, camping. Day 08: Trek from Doban to Sallaghari, camping. Day 09: Trek from Sallaghari to Italy base Camp overnight at tent camp. Day 10: Trek from Italy base camp to Dhaulagiri Base Camp (4700m). Day 35: Preparation to returning (Clean Base Camp). Day 37: Trek from Yak Kharka to Jomsom (2710m), about six hours, teahouse. Day 38: Fly from Jomsom to Pokhara, about 20 minutes, overnight hotel on BB Plan. Day 39: Drive from Pokhara to Kathmandu by tourist bus that takes about seven hours. Day 40: D-Briefing, Leisure day and shopping in Kathmandu; evening farewell dinner. Transfer airport-hotel-airport for International and domestic flights. Welcome group dinner in Kathmandu. Transportation of staffs, food supply and equipments from Kathmandu-base camp-Kathmandu via Tatopani (road head) by vehicle and porters. Full board during trekking to base camp at the local lodges before and after expedition. Single tent with mattress at Base Camp for each member. 4 bottles of Oxygen per members with a mask set per member. 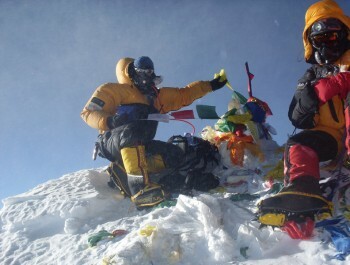 Support of one high altitude Sherpa per member to carry all food and gear to higher camps. Also assist members during climb and summit attempt with 3 bottles of oxygen and mask set. Common climbing equipment (Required rope, ice bar, ice screw, etc). 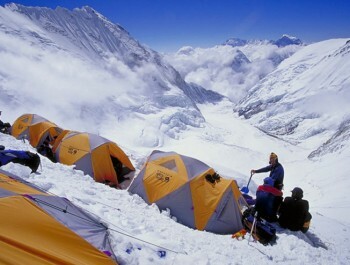 High altitude tents for all members and climbing Sherpa. Applicable National Park and entrance fees. Restop toilet bags to bring human waste off the mountain for all members. One walkie talkie sharing between client and Sherpa. All kitchen tent, store tent, dining tents, toilet tent, table and chairs and cooking utensils for Base Camp. 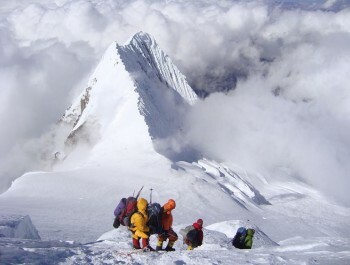 Insurance of climbing Sherpa, cooks, Kitchen Boys, Liaison Officer and porters. Equipments allowance, wages for Government Liaison Officer, high altitude climbing Sherpa, cook and kitchen boy. Hotel accommodation beyond 5 nights (as per itinerary) stays in Kathmandu. Excess personal member’s baggage transport Kathmandu-base camp US$ 8 per kg one way. Expenses of personal nature such as hard and soft drinks, laundry, postage, telephone and Email, etc. Applicable customs duty and import license fees for all expedition goods arriving in Nepal as air/road cargo. Personal power pack for charging heavy electronics (laptops, professional camera batteries etc).